The Olde Allegheny Community Garden, located in the Mexican War Streets neighborhood of Pittsburgh's Northside, is seeking to commission a new, or buy an existing, artwork for the garden. Below are the details and deadlines. Olde Allegheny Community Garden is seeking to commission an artist or artist team to create a new work of art or place an existing work of art in the Olde Allegheny Community Garden, located between Sherman Avenue and Veto Street, just north of Gentry Way, in the Mexican War Streets neighborhood of Pittsburgh's Northside. Specifically, the artwork will be installed in an island rock garden in the main path. The island measures 4 feet by 5 feet, and the art must fit completely within the island. The artwork will be a focal point for pedestrians and garden visitors and will serve a functional purpose of slowing bike traffic and defining the thoroughfare for pedestrians. Aesthetically, it will complement the surrounding natural beauty and provide interest during winter months. The artwork must be secure and stable and should be safe for pedestrians, with no sharp protrusions. Height is encouraged, though the design should respect the adjacent garden plots by not creating excessive shade. Materials may vary, but should be suitable for year-round outdoor installation and non-leaching. Use of recycled materials is encouraged. Artwork allowing for light planting around the base in the rock garden is also encouraged. 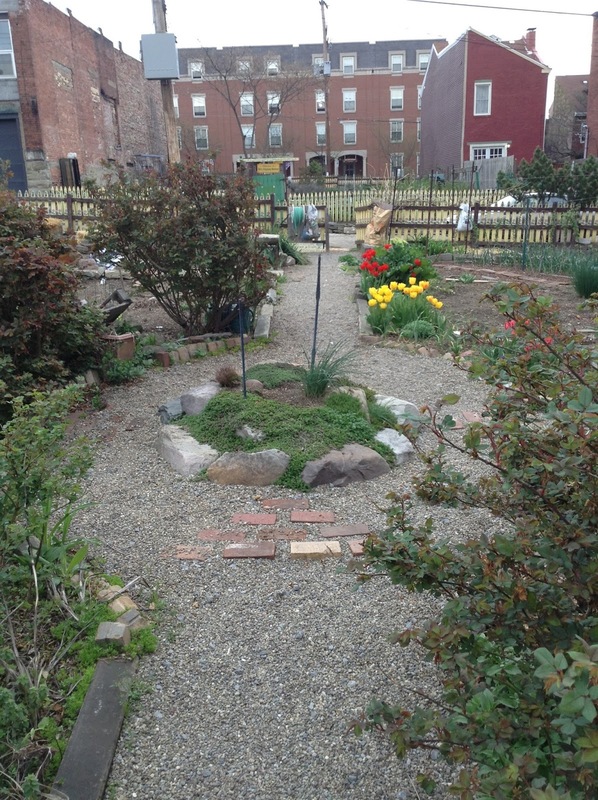 The Olde Allegheny Community Garden was started in 1982 in the historic district of the Mexican War Streets. Recently expanded from 40 to 50 plots, the garden is full and maintains a waiting list. Gardeners have chosen to grow organically. The site is open to the public, and the central path is used regularly as a pedestrian through way between two contiguous city blocks. The budget for the completed artwork is not to exceed $1500. The selected artist or artist team will receive 30% of the estimated cost upon approval of the proposal, with the remaining balance paid upon approval, completion, and installation of the project. This fee is for all costs related to the project, including supplies and materials, installation, and fabrication of the artwork. Proposals from artists or artist teams living in Pittsburgh will receive priority over non-Pittsburgh residents. The Olde Allegheny Garden Art Committee will choose an artist whose work, style, aesthetics, and vision best fits the scope of the project. The selected artist will have four weeks to submit a proposal and timeline of the artwork, including sketches or images. The committee will present the proposal to gardeners for approval or revisions. A photographs of the installation site is shown below. For any additional information or to visit the site, please contact Jana Thompson at tailsonhigh@earthlink.net.